A colleague of mine is super well-versed in everything subscription boxes and has already gotten me addicted to Julep's nail polish. When she told me about Stitch Fix, I had to give it a try. Stitch Fix is basically a mail order personal stylist. You choose when to receive a box (or "fix") and answer a bunch of questions about your body and style. Stitch Fix's stylists curate a box of five items for you and they're shipped to your door. You try them on, decide what to keep and what to return, make your selections online and give feedback about your items. You only pay for what you keep and the $20 styling fee is credited toward any items you purchase. If you buy all five, you get 25% off everything. I reasoned that even if I bought none of the items, $20 was a great price for someone hand-picking five unique items in my style and sending them to my door to try! 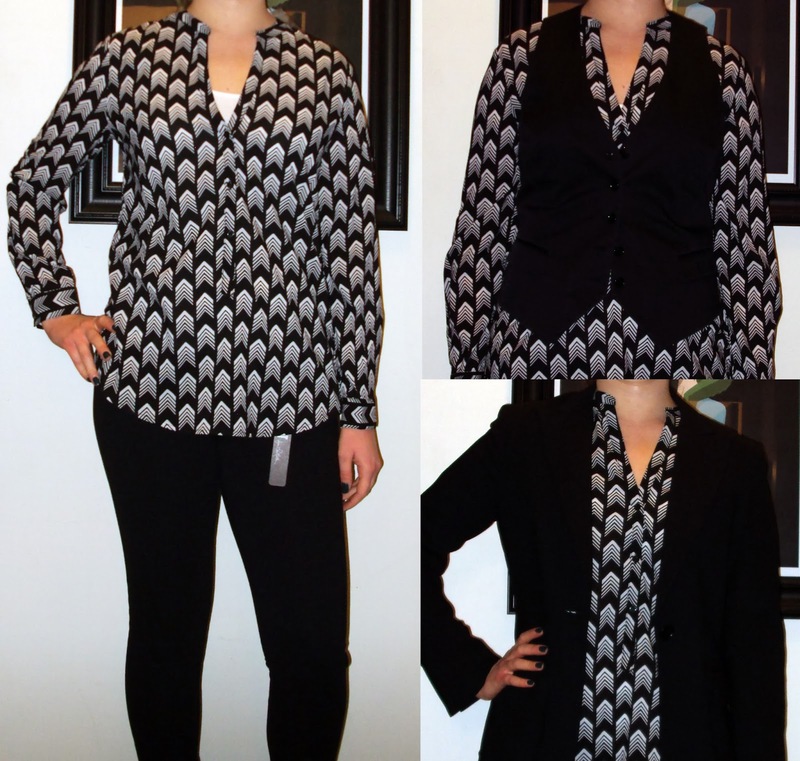 Let's review my first Stitch Fix box! They include a note from your stylist responding to your requests and needs, plus little cards suggesting how to style each item. This top feels great, flows over the body well, and looks polished but not too buttoned up. Plus, you know I love a graphic print. 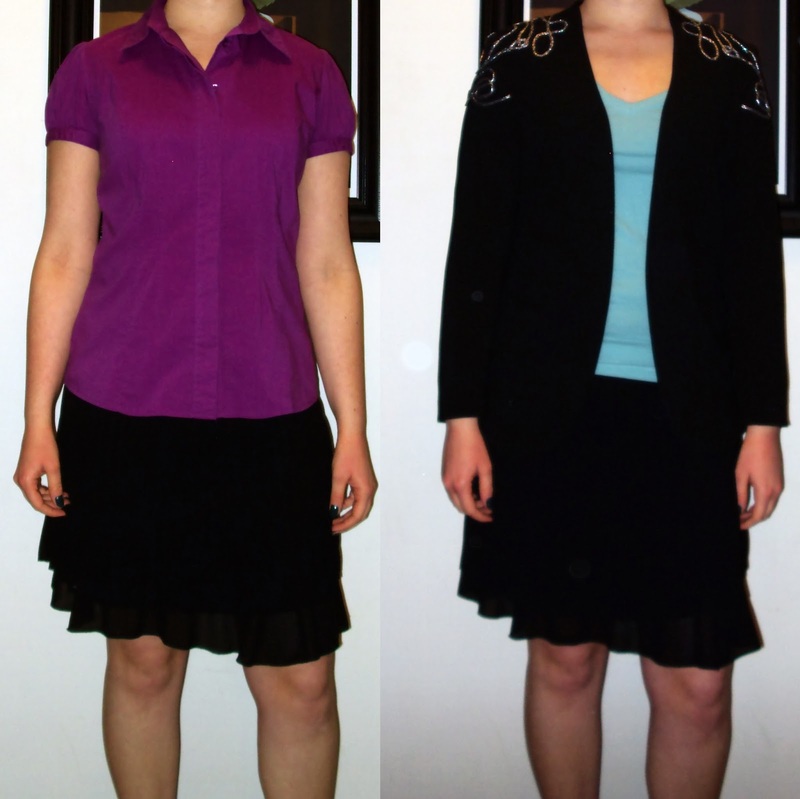 At $48, it's more than I would generally spend on a shirt, but I tried on a few different looks and reasoned that its versatility made it worth the splurge. I had noted I was on the hunt for a black faux leather skirt and my stylist included this one as a substitute. It was a great idea, but the chiffon is just too flouncy and light a fabric for my style and life. There was also a seam that wouldn't lie flat, and while I know accordion pleats are hard to seam, it was still a silhouette issue. Even at $28, this had to be sent back. I hadn't mentioned this to my stylist, but I had been on the lookout for a solid color dress that I could wear to work, especially with blazers. I love this dress' scoop neck, empire waist, fit and flare silhouette, and how it hits right above the knee. As you can see, I played around with several different styling options and I like them all! The proportions just work, which isn't easy to find. That's why I'm keeping it despite the $78 pricetag. This was a good idea with a few key execution issues. I'm not much for pastels, especially peach, so I would have liked to see the color panels be brighter and/or darker. The fit was also strange. I have long arms, but the sleeves still pooled on my wrists (check the picture). The torso was the exact opposite - it was too short as it barely hit my low waist. Finally, as you can see below, there was a bit of fabric pooling in the lower peach panel. This $64 sweater clearly wasn't in the running. Overall, I'm super happy with my "keeper" blouse and dress and scheduled another fix for a few months out. I'll be ready for some spring and summer items by then. The entire process is fun, especially the anticipation and excitement of unwrapping five new items without setting foot in a store. I'm already looking forward to checking out what the stylists pick next! Have you tried Stitch Fix? Any questions about the process? I was googling my stitch items by name before they were delivered and I am being sent the lyla striped sweater but funny enough they say it is only $34 for me. I wonder if they are sneaky and charge different based on your settings. Katie, that's so interesting, especially since it's such a deep price cut! Thanks so much for sharing. I'll have to keep an eye on prices when I Google the items in my next fix. I hope the sweater works out better for you!